4) that as Lord Rama and did what is related in the Ramayana, defeating demons (rakshakas), flying in the Pushpak aircraft - powered only by mantras', banishing his wife, killing Ravana and so on. Comment: These accounts may be believed by many innocent, naive and credulously believing Hindus who think Sathya Sai Baba genuinely represents their religion, but neither historians nor the world community at large will ever do so. 5) That he is also no less than the avatar Lord Vishnu, come again to save humanity, as predicted in the mythology of the Srimad Bhagavatha. Seems the Kentucky creationists have left out an important era of prehistory (perhaps they are too ignorant?). That is, if Sathya Sai Baba’s divine testimony is anything to go by! Comment: Fingertip to elbow measures 19 ins. So Rama was 14 time 19 inches high which = 266 inches. Oh yes, the first aeroplanes – India flew them over 3000 years ago! Dr. Hislop also asked: “In those days they had aeroplanes, did they not?” Sai answered: “The first was ‘Pushpak’. 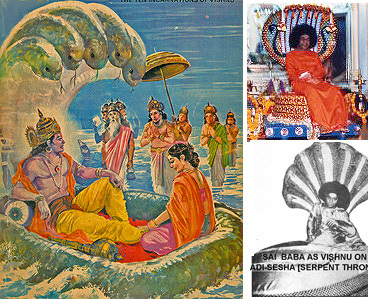 The one Ravana used to kidnap Sita.” (Comment: Sita was, of course, Rama’s wife…which also means, according to Sathya Sai Baba’s claims, his former wife in his former body). Sathya Sai on Hanuman as a real figure who did what was claimed! Hanuman, presented as almost the greatest devotee of the mythical King Rama, was a 'monkey man' who supposedly jumped dozens of miles - and also carried a whole mountain so a healing herb could be picked from it. And he makes very clear that this is no myth for Sai Baba, who claims he was Rama once, and Hanuman his trusted servant! 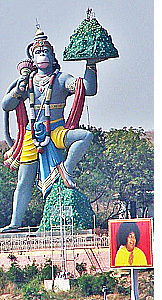 Among the extremely tall and massive garish statues at the Hillview Stadium, Puttaparthi, there is a monster 'Indo-kitch' representation of Hanuman holding a mountain aloft. The money for all these useless artefacts comes from donations intended to help the poor, needy, analphabets, the diseased, ill and suffering peoples and for many world visitors these are white elephants which typify the usual Indian extravagance and waste among such enormous poverty and suffering. 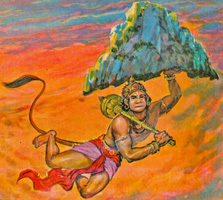 That Hanuman is described variously as a 'monkey' or a 'monkey-man' and is pictured with a monkey face and a tail makes this story unbelievable to anyone with a modicum of knowledge of paleontology.More likely the myth is based on the perception of them by Arian Hindus who came from the North and met with the indigenous Dravidians who were (and still are) darker and who were free and physically agile as 'noble savages' who lived closer to the wild (as of course do do monkeys). So the reader is supposed to take this to heart... Sathya Sai Baba is that same Lord, very hard to recognise, and we all should compare ourselves to the astounded and amazed villagers!! The second version is reported in a book one of the early Western devotees, Alvin Drucker, produced with the aid of an Indian translator from talks to his students in Telugu in 1984 which Druckerrecorded. 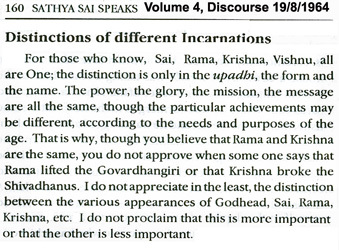 ( Discourses on the Bhagavad Gita - p. 32 first ed.). In this version, a poor boy cowherd was told by a pundit Harikathadas that Lord Vishnu was traditionally represented as "dark/complexioned, wore a traditional white mark on his forehead, and rode on a white eagle". The story dwells on all the boy's exaggerated penances and prayers and concludes by Vishnu manifesting himself in the form desired by the cowherd. The discrepancy between the two 'tales' is typical of many of Sai Baba's stories and alleged accounts of ancient events to which he claims to know or have attended! My old friend and elderly editor of The Sanathana Sarathi monthly journal, former journalist V.K. Narasimhan, related to be how he felt bound to correct errors and mix-ups that Sathya Sai Baba frequently made in his discourses. Narasimhan translated and edited these for nearly 2 decades. He told me how he was worried that he would be 'brought to book' (as it says my notes recorded at the time) by people who might hear the recorded tapes and compare them to his altered versions. He said that these versions were personally endorsed by Sathya Sai Baba each month. Another similar incident about whch Narasimhan also told me was - while interpreting a Sai Baba talk to Englishabout Kalidasa's famous play concerning Shakuntala and a wedding ring, Sathya Sai mixed up the story by making the ring a gift from Shakuntala to the king. However, in the original, the gift was from the king to Shakuntalah. Narasimhan told me he had whispered this to Sai Baba, but was told to translate it just as he had said it in Telugu, that is, the incorrect version. Apparently it did not seriously affect the plot of the story. Comment: The above, where even a once acclaimed journalist falsifies fact to make Sathya Sai Baba look better, indicates the the sloppy and calculating nature of all reporting on Sathya Sai Baba by those who dare not challenge him on the slightest point.